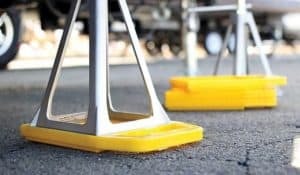 If you’re shopping around for the best RV jack pads, you’ve found the right buying guide online. We understand and recognize how it can be hard to find the right one for you especially that there are many of them online promising the same thing of convenience, durability and ease of use. Some have an interlocking design like a Lego, while others are solid rubber pieces with a built-in handle. But still, all of them have the purpose of helping us stabilize our vehicles especially when parked on an uneven surface, asphalt, paved ground, rocky or graveled area. To help you pick the jack pads for your vehicle, we’ve put up a review of the 10 best products in the category, highlighting each of their pros and cons. Also today, we’re going to answer the most common questions surrounding these jack pads and a short buying guide to help you compare and weigh your options. If you’re ready, let’s begin with the top jack pads and later discuss the things to look for when buying this RV product. The 44595 is one of the most important accessories to have for your recreational vehicle because they can help in preventing your jacks from sinking. The Camco’s RV Stabilizing Jack Pads can help in preventing your jacks from sinking into the ground. 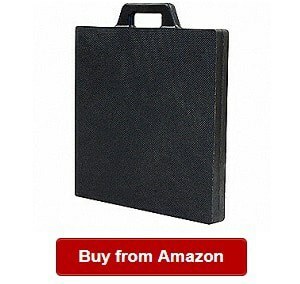 It is one of my recommended products in the category because it is reliable to perform based on its intended purpose. You can just imagine finding a sloping parking space or slot, but with the leveling system, you can have peace of mind that you can have a leveled ground where to place your recreational vehicle. Another thing I liked about the pads is that they are made with heavy-duty materials. They’re what we need if we want to level our RV in the camping site all the time. As we know, some of the RV camping parks are slopes, which is why we cannot level our rig. It is also one of the reasons we have to carry leveling blocks with us. These stacker blocks, stabilizer pads or jack pads are a big help for us RV owners because they can keep our jacks from sinking into any soft surface. The RV pads are made with durable materials; they won’t be damaged even when left outdoors for a couple of days. They are made with UV stabilized polypropylene, which is one of the most durable to use when creating jack pads. 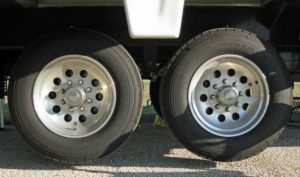 I also liked that the pads are versatile to use for fifth wheels, travel trailers, campers, trucks and other vehicles. The jack pads also have a large surface area, which makes them more versatile and ideal for use in many applications. You will also like that they’re convenient to store. In fact, they are so easy to keep because you just have to interlock them using a handy strap included. More so, I would like to note that the recreational vehicle jack pads are already a pack of four pads that make them perfect and handy to use whenever we need them. You can also have peace of mind that they’re high quality, as they’re tested for durability and are made in the USA. On a drawback, they should not be used with hydraulic jacks. But overall, the Camco 44595 is a great choice for its versatility and durability. The Quality PlasticsUtility Block is one of the top picks in the category for its solid features and performance that I liked about it. When shopping around for new jack pads, you should not miss out the Quality Plastics because it offers solid performance. It is a versatile pick for many applications and uses. With the jack pads, you will not have to worry about the jacks sinking into the ground or your rig not parked in a leveled ground. This leveling system is one of the best options around for its versatility and ease of use. You just have to put them under the jack so that it won’t move. I would also like to note that the product is made with rubber materials, making them not only easy to use but also better at gripping. It is to prevent the jack from slipping and the pads moving in the ground. 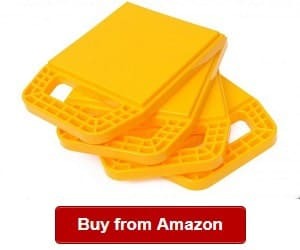 If you’re looking for a durable and high quality jack pads, you might not have to look any further if you have the Quality Plastics. The materials can withstand constant exposure to the sun and other harsh elements. As you might know, outer elements that also include the rain, wind and other unpredictable outdoor pollutants can ruin the pads. But as the Quality Plastics are made with heavy-duty materials, it won’t be ruined by the weather and other harsh elements. 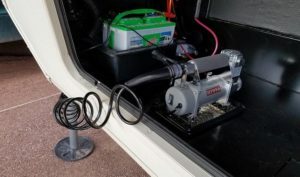 The Utility Blocks can also make it so easy for us to level our motorhome or recreational vehicle because we don’t have to worry that it will slip. In addition, you don’t need to worry about the blocks not being able to take up heavy weight because they are resilient and heavy-duty. In addition to using them for jacks, they can be used with any kinds of tire. In this case, you don’t have to worry about them not fitting well in your jacks/tire brands. On a con, the smell can be annoying for some people. But overall, it is a versatile choice because you can also use it as leveling blocks for your rig. This product also comes with a rope handle and a keyed slot for accommodating any awning rod. Finally, I liked that the blocks can nest together for the ideal design of having a recessed bottom and a raised top ridge. If you’re looking for a complete package and heavy-duty trailer jack blocks, you should not miss out the Anderson Hitches 3608. It is an innovative and fun to use trailer stabilizers to give us peace of mind whenever we have to park our recreational vehicle in a sloping site. As you may know, some of the RV parks that we visit do not have a level ground where we can park our rig. In this case, it can be troublesome or worrying if the wheels are shifting from one side to another. The trailer jack blocks version have built-in magnets, which prove the model to be more valuable. They are convenient than ever to use and versus other jack blocks. Another thing I liked about the Anderson jack block is that it does really prevent the swaying and movement of the trailer or recreational vehicle. It does only mean that our trailer or rig will be less stressed. This six-pack option will give us all the blocks needed for our rig or trailer. So if you’re looking for a reliable leveling system, you might want to take a second look at this model that has built-in magnets to attach to the jack. What does that mean? It only means that we do not have to check or adjust every block whenever we have to do the leveling. 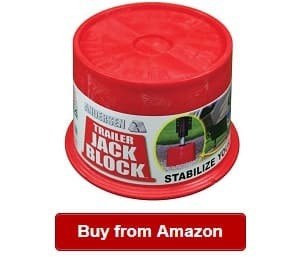 I’d also like to recommend the jack block model because it comes with a Bonus Clean Step, preventing up to 90 percent of dirt that could have end up in our travel trailer, camper or recreational vehicle. On a drawback, it is expensive. 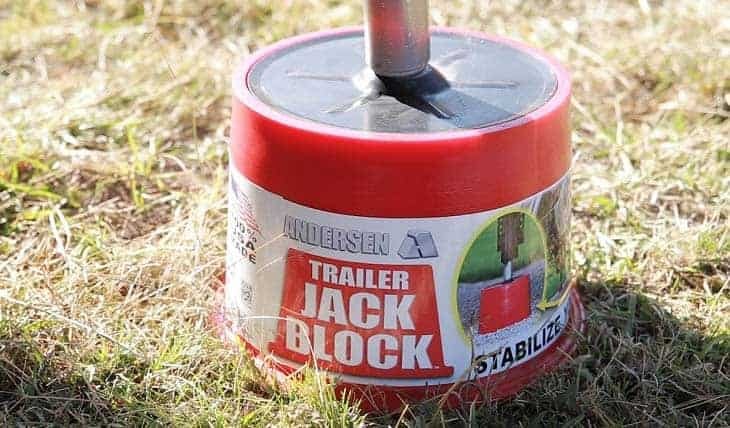 But overall, you can depend on the Andersen ‘Trailer Jack Block when used with your stabilizing jack because leveling will be solid. This block can help in creating up to 90 percent of less rocking especially when others are moving around inside our camper. If you would like to shop around for the best jack blocks around for your trailer, you should not miss the durable and strong Level Trek LT80050. 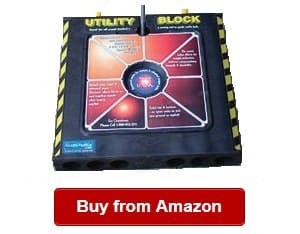 It is one of the most reliable jack pads or blocks around. It has the solid features and performance that we’re looking for in comparing different jack blocks. When we’re camping, sometimes it is hard to find a leveled spot in the camping ground. In this case, we need to use a leveling system or pad in order to prevent the jack from sinking into the ground. One of those that I liked about the block is that it can also be stacked if you’re looking to add some height. In addition, we can double them as step stools or seats. The Level-Trek LT80050 is also made with durable materials that can last longer than ordinary jack pads there are. When it comes to durability, it is also one of my most recommended especially if you want to get more of your spending. This model is designed and built to last for years, so you can also expect that the blocks can withstand harsh conditions and weather elements. In addition, it can be used with a wide range of jacks, adding to its versatility and value. This feature is one of those that we can rely on if we want a product that gives us more value for our spending. It is necessary for our recreational vehicle to have durable and reliable accessories like it. I also liked that the pad size also offers a larger surface area, making the pad ideal for use in many types of tires and jacks. On the downside, this product might break if put under a heavy RV. 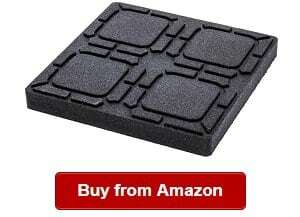 But then, it is an ideal choice for recreational vehicle owners looking for a reliable and heavy-duty jack pad. Another product not to miss when finding RV stabilizer jack pads is the SnapPad that already comes with six leveling jack pads, which are suitable for nine-inch metal feet. 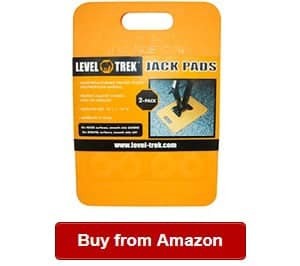 As it already comes with six in every pack, you can have peace of mind using the leveling jack pads because there will always be jack pads ready for use. The Xtra Ultimate can fit or is compatible with LCI ground control or level up 9-inch feet on fifth wheels and recreational vehicles. Another thing I liked about the SnapPads is that we can install them in minutes. We don’t have to waste so much time when setting up the jack pads. Using the Snap pads, you can install them quickly and eliminate any leveling inconvenience like when we have to use wood blocks. When trying to set up, we conventionally crawl under the rig when setting up, but that is what the snap pads are eliminating. I also liked the stability with which can provide our recreational vehicles. When you use the leveling system, you can be sure that it will increase stability by giving more vibration dampening, providing a larger footprint and conforming even to uneven terrains like rocks and gravel. Using them, we don’t also have to worry about slipping on slick surfaces or in high winds. In addition, we don’t have to pop jacks anymore with the snap pads. SnapPads are also made from high quality rubber that will grip on all types of terrain. So this time around, you don’t have to worry about your recreational moving or shifting from front to back. More so, I’d like to recommend the SnapPads because they’re rugged and durable because the manufacturer made use of a rigid process to make them extra heavy-duty. This product is also made resistant against damage due to exposure to harsh elements like water, wind and sun. It is also resistant to head, oil, tar and mud, along with other outside hazards. I also appreciate that the SnapPads can protect our metal landing feet from any damage. On a drawback, the jack pad is not the most durable around. But overall, it is still the top pick for recreational vehicle owners who want an easy to install leveling system that can also offer reduced vibration and movement of our recreational vehicle. Whenever we’re camping, we sometimes do not find an even parking surface. So we need to use our jacks, blocks or a leveling system. 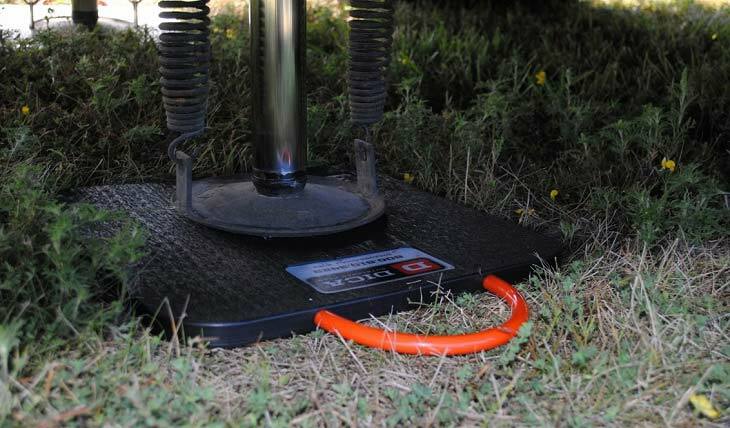 However, the jack can sink into the soft ground if we’re not going to use an RV jack pad like the Tri-Lynx 00019. By choosing the Lynx Cap 4-pack, we can worry not about leveling our recreational vehicle when we get to the camping site without an even parking surface. The Tri-Lynx 00019 can create an even leveling system without any hassles because they install in minutes. This time around, there is no need to crawl under your vehicle when setting up, increasing safety, too. Another good thing about the RV four-pack jack pads is that they also have a larger surface area, fitting most large vehicles, including trucks and other travel trailers. Using the Lynx Cap 4-pack, you also don’t have to worry about them slipping out of place. The pads are made with an interlocking design for a secure and strong fit. 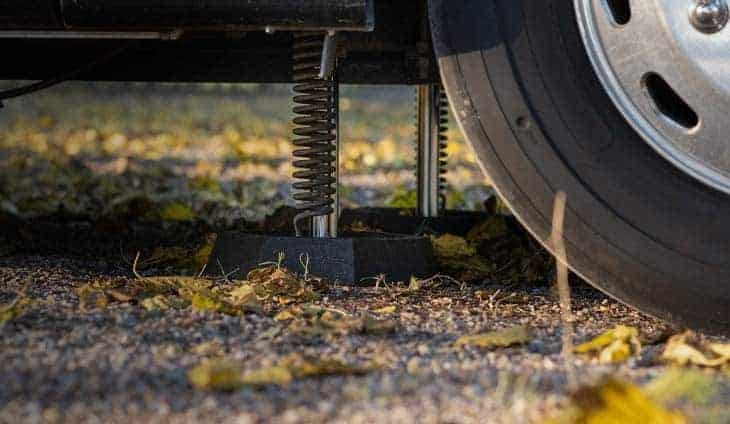 So if we’re working inside our RV or someone moving inside it, we don’t need to stress about our rig vibrating or moving, too, when parked in an uneven surface because we can use the jack pads to prevent our jack from sinking into the ground. Due to their ideal design, I noticed that the levelers could conform to the ground well, working even on rocky or gravel area. And we want something like it to ensure of dampened vibration or movement of our vehicle. The Lynx Caps are also valuable if you want to create a full flat surface on top of a leveler. These caps with interlocking design aren’t going to increase the stack height, perfecting the fit. The product can provide a flat and an interlocking surface for stabilizer jacks or wheels. It is one of the best choices to secure our travel trailer or camper. On the downside, the interlocks might sometimes slip. Overall, I liked the Lynx Cap because it can fit a leveling function well and have a great capacity to accommodate up to 40,000 lbs of weight when used with Lynx levelers. If you’re shopping around for the RV leveler pads and are looking for a great product that can last for years, you might want to give the Buyers Products OP18X18R a second look. It is one of my favorites when it comes to ease of use. For one, it has a built-in handle that makes transport and storage so easy. You don’t also have to crawl under your vehicle just to set it up because it offers a no-hassle performance. All you need to do is to put it under your stabilizer jack and you’re done. Especially if you’re in an RV sites that do not have a leveled ground, you can count on the outrigger pad that is also made of durable materials. This particular product is of two inches solid rubber, which is thick enough to handle pressure and heavy weight. The rubber is also a good material to ensure firm and tight grip to prevent slippage. Having a product like it on board, we can also add years to the life of our recreational vehicle. It can take the pressure off and ensure the rig will be leveled when parked on a soft, uneven ground. With the leveling pad, the jack won’t also sink into the soft ground. And by saying that, we don’t also have to think about any sudden movement of our rig if people are moving inside it. Without even saying, the RV jack pad can increase our peace of mind. In addition, we can use the pad in leveling an awning arm and other applications where a leveler is needed in the camping ground. I also noticed that this product has a textured surface, making it ideal for off-road, paved surface and concrete use. It is also versatile enough for use in an outrigger-enabled machine or equipment. On the downside, the pad might break when used on gravel. But overall, the textured surface design, solid rubber construction and ease of use features as its built-in handle still makes it one of the best choices for RV owners looking for a topnotch jack pad. Check out the 8.5” x 8.5” leveling blocks from this brand, which has been around for a long time and has been one of the top choices among recreational vehicle owners looking for solidly performing flex pads, which can be used with other levelers and jack pads. I also noticed that the blocks have an ideal design that makes them ideal for use on an uneven surface like on top of tree roots and gravel. With that said, you can have peace of mind that they can be used on a wide range of applications where a leveling system is needed. That also said you don’t need to worry about your rig not being on a leveled ground. It only means an increased lifespan for your vehicle and safety for the people on board the vehicle. For example, if you’re working inside the vehicle, like preparing food, you don’t have to worry about sudden movements or vibration of your rig because it is leveled on the ground. Using the jack pads, you can also increase the safety and prevent the damage of sensitive electronics like the best 12 V refrigerator and other sensitive electronics. You can protect and add years to their lives, meaning more value for your investment, too. 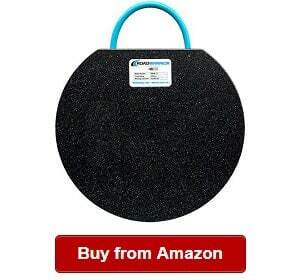 So if you would like to make use of reliable leveling pad that can help you keep your rig and the appliances in it working optimally, you should check out the Camco 44600. You will also appreciate that the product is made with weatherproof and UV resistant materials. It only means they’re made for long-lasting use. They are heavy-duty to last for many years. Plus, they are made with weatherproof and UV resistant materials, so they can deal with the changing weathers and harsh outdoor elements, such as wind, rain and sun exposure. The leveling jack pads are versatile and useful that they can be used under leveling blocks and jack pads in order to prevent them from cracking. The non-slip pads are also environment-friendly being made with recycled materials. On a downside, the product might break under heavy pressure. But overall, you can rely on the pads, which are also ideal when used with other levelers and jack pads. 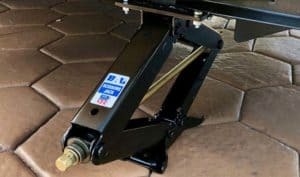 When searching for RV stabilizer bars, pads or levelers, you should look for a product that is versatile enough to use even on hydraulic levelers and stabilizing jacks. The AP Products 4725 is one of the most versatile and useful products around, so it deserves to be a part of this list. It is a pack of four that can be used with stabilizer systems and levelers. One of the things I liked about the 4725 is that it comes with a built-in handle, which makes it easy to transport and carry around. Using them, you don’t need to worry about taking them from one place to another. The handles also allow for quick and easy storage. Another thing that makes the 4725 a decent choice for owners of fifth wheels, campers and travel trailers is that they are strong and durable. They are also weight tested to accommodate up to 40,000 psi. You can rely on these pads for heavy-duty use. They can also protect against the sinking of stabilizing jacks and levelers from sinking into gravel and dirt. They can also protect them from cracks and damage. We can also ensure that other pads and leveling systems won’t be damaged when used on gravel, rocks and paved surfaces. Another thing that makes the blocks ideal for use is that each of them is 14 inches high, ¾ inches thick and 10 inches wide, an ideal set of dimensions. They are flexible to use with other pads and levelers because they have large enough surface area, which can also fit most wheels and jacks. I also noticed that they are weighing less than a pound, making them indeed a breeze to use. One more thing I shouldn’t forget is that the product comes with a 5-year manufacturer warranty. On the downside, the levelers can crack when used on gravel. But overall, the 4725 is a decent choice if you’re looking for leveling blocks you can rely on for long-term use. The Camco blocks are the first choice because blocks are flexible and ideal to use for motorhomes, RVs and trucks. These blocks can offer a safe and secure leveling option. They will not break down under any heavy pressure. The 15.0″ Diameter RV stabilizer pads are some of the best choices around because they are versatile, durable and high quality. One of the things I liked about the Road Warrior is its user-friendly handles that make the jack pads are easy to transport and store. It has TuffGrip Handles, which are unbreakable and waterproof, ensuring ease of use and convenience. You will also love that they can make setting up and retrieving fast and easy without you having to crawl under your vehicle. You can place them under the recreational vehicle in a flash in minutes. I’d also like to recommend the pads because they are industrial strength and guaranteed to be unbreakable. You can look forward to long-term use if you have them with you for your recreational vehicle. From time to time, we are going to RV parks where there are no even surfaces for parking. In this case, we need jack pads that we can use under the jack so that loads can be distributed equally. These jack pads can offer us with a level and strong foundation, so we can be at ease when we’re working inside our recreational vehicle or our loved ones are moving inside it. The jack pads can help us achieve a level and strong foundation. They work by preventing the jack from sinking into the ground or becoming damaged by paved surfaces. We can use these pads on top of tree roots, rocks or gravel. On the downside, the jack pads care sold separately. 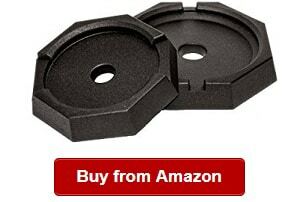 But still, this product is one of the top choices in the category for leveling pads for campers. They are reliable and heavy-duty to perform, as they’re intended to. SmartRVing.net is your one-stop website for all things RV! We all love our mobile home, travel trailer, camper, recreational vehicle or motorhome, so we only want to make use of the best appliances, gears, accessories and systems for it. Just like when shopping for the best RV wheel chocks, we should consider our options well. For this reason, we have considered our options well in choosing the products to review and include on our list. To help you further make a good decision, we have also created a short buying guide listing down and discussing the things that we have to look into when narrowing our options. 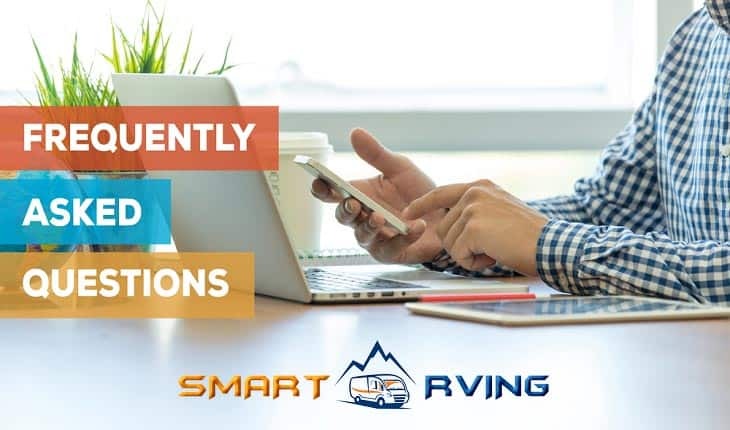 Smart RVing makes use of this system in order to make sure that we’re only reviewing deserving products for your comparison along with each of their pros and cons. Our reviewers are also seasoned RVers that have combined years of experience in camping with your travel trailer. With our knowledge and skills in RVing and using different recreational vehicle appliances and equipment, we have learned about what makes a certain product good and bad. From these reviews and guides, we do hope you can pick the right jack pads that will give you satisfaction and many years of service. An RV jack pad is an essential accessory for the recreational vehicle because it can help in distributing the jack loads safely in order to provide a level and strong foundation. Most of them are industrial strength and heavy-duty to last longer than homemade RV jack pads can. They work by preventing the jacks from sinking into the soft ground, giving us a level and solid foundation for the safety of our vehicle. They have an interlocking design that makes it easy to stack and use under the jack. As they are also made with durable materials, they can also withstand heavy stress and pressure. The best of them will not also absorb water, crack or splinter but can safely distribute the recreational vehicle jack load over the ground, ensuring your trailer or recreational vehicle level and safe. Many of them can also support the RV jacks to prevent their feet from bending due to sinking into the ground. There are many jack pads on the market, and that is the exact same reason it can be hard to figure out how to buy this product if you don’t know their types. 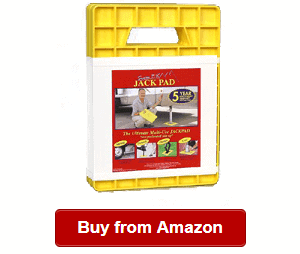 At the very least, jack pads are made of solid rubber materials or plastic. So when it comes to types, they can be based on the materials used. When it comes to types, there are not many of them actually. You just have to pick based on the materials used in the construction based on your preferences. For example, rubber jack pads are chosen because they have a strong and tight grip and won’t slip. You can place them easily and conveniently under the stabilizing jacks without any hassles. More so, they can also be used with other blocks, levelers or jack pads and provide more stabilization. In the following are some of the things that make the RV jack pads a real necessity for our travel trailer, camper or mobile home. Affordable: The best products out there are not expensive, yet they are made of high quality materials. They are reliable, but they’re not expensive. As they are affordable, you can buy bulk or many jack pads so that you can have some of them in your stock and that they can be ready whenever you need them especially when you lost a few. 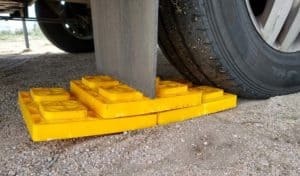 Easy to install and remove: Using leveling pads for your jacks, you don’t have to crawl under the vehicle to set them up. You can install them in minutes without outside help. Weatherproof and UV stabilized: These leveling blocks are made of durable materials that can withstand the changing weather or temperature. Won’t break or crack, heavy duty: The best of them can handle pressure and stress. They are durable to carry up to or more than 40,000 lbs. You can have peace of mind that they won’t be cracked or broken even if your vehicle is heavy. Can be used with other leveling systems – Some of them are also flexible enough to use with other leveling systems, including blocks and pads. There you have some of the things that make the jack pad leveling systems useful to have in our recreational vehicle. You should have them if you want to add life to your RV and keep it stabilized when standing or parked on an uneven surface or ground. The jack pads can keep the jack from sinking into the ground. Before buying RV jack pads, you should know what to look for in order to make sure you’re buying the right ones for your travel trailer or camper. In addition, knowing certain factors will also help you in narrowing your choices, eventually saving your time and effort from browsing through many choices that do not fit your needs. Check out the following to get started. We don’t want to spend a couple of times on the jack pads just because what we bought is damaged or cracked. We don’t also want those that can easily be ruined by changing temperatures especially constant sun exposure and being placed outdoor and exposed to harsh elements. Durability can also translate to quality. For example, we should buy industrial grade jack pads to ensure that they can handle extreme pressure and stress. We should stay away from products that can easily be damaged when exposed under heavy pressure. For this reason, you should look for jack pads that have higher capacity, such as those that can withstand up to 40,000 lbs. In addition, you should look for one that is made with special materials including a special resin that can add strength to it. Nevertheless, take note that you’re going to use the leveling jack pads to keep the stabilizing jack from sinking into the ground and achieving a level surface for our rig. In this case, we must opt for pads made with heavy-duty materials. These two are important to consider because they can make a difference. For example, a good one will be able to compensate a larger area in order to prevent the stabilizer jack from sinking into the ground. It will also protect the jack from bending its foot or being damaged. Nevertheless, jack pads with larger and wider dimensions tend to be better options than smaller ones are. Talking affordability is not about which product is most affordable. It is not the cheapest RV jack pads that will save the day but quality ones at reasonable prices. In general, jack pads are not expensive, but some are just too affordable. You should not base your decision according to the price alone because the lowest price or the highest price is not the sole indicator of the quality of the product. When determining the price, you might also want to consider thinking about whether you want to buy a separate product or one that comes in pack of 4 or 10s. It is up to you based on the b number of jack pads you think most suitable for you. You can decide on it based on your needs or requirements. Some of them come in four or in 10s. On the other hand, there are also some of them to find as a separate leveler or block. So when deciding on the number of jack pads to buy, it will depend on how much elevation you want. More blocks will be needed to create a higher elevation. But then, you might want to buy a pack with more jack pads included so you will have a reserve just in case you break any of them. Thus, you must be able to decide on the quantity wisely when shopping around for jack pads. You can compare your options using our guide. Another important thing to look for when it comes to shopping around for good RV jack pads is their weight capacity. Some of them have a high weight capacity reaching up to 20 tons or 40,000 lbs. 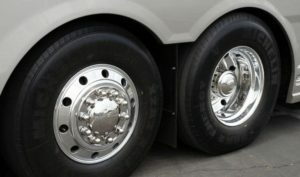 It only means that they can accommodate up to five tons or 10,000 lbs of weight for each wheel. It is the ideal choice for many heavy-duty trucks, travel trailers, campers and recreational vehicles. On the other hand, you might want to get past 20.5 tons if you have a larger and heavier vehicle. Thus, you might also want to check your vehicle’s weight to select the jack pads that will fit its requirements. There you have some of the things to remember when choosing RV jack pads. So based on these factors, you can compare the different RV jack pads that we have reviewed above. Q: When are jack pads required? 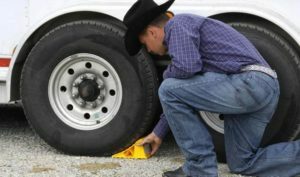 A: The jack pads are needed when you need to level your recreational vehicle on an uneven surface or ground when using an RV jack. Each pad is where the jack is placed over to prevent it from sinking into the soft ground or being damaged by paved surface. Q: What are good jack pad brands? A: We recognize that choosing among RV jack pads on the market can be easier if we know of good brands. Upon searching the web, comparing options and creating product reviews, we did come up with some of the best brands to pick from and use for your outrigger-enabled equipment, motorhome, camper, travel trailer and recreational vehicle. A few of them include Camco, Quality Plastics, Origen RV Accessories, Andersen Hitches, Level Trek, Tri-Lynx, Buyers Products, AP Products and RoadWarrior. You can check them out, make a comparison and pick which one suits your needs best. Q: How many jack pad do I need? A: Most of the jack pads are like Lego blocks. They have an interlocking design, so they can be stacked and used under the jacks in order to achieve a leveled ground to park our RV. Some of them also come as a single, solid rubber to have them under the stabilizing jack or to be used with other leveling blocks or pads. They can supply more stabilization to our rig, so the number to use will depend on how many you’d need for a specific situation. Q: How to make RV jack pads? A: Some people do make their jack pads by recycling old tires, and you can do that, too. On the other hand, I found some cool guides like this source detailing the steps on how to make your homemade RV jacks. But if you don’t want to go through all the hassles, I believe it would be more practical to buy RV jack pads. They are expensive, anyway. Q: How to install jack pads? A: It is very easy to install an RV leveling system in the same manner that we’re installing leveling blocks. We can simply have it under our stabilizing jack for better leveling. On the other hand, these levelers can also be used with other jack pads or blocks. A: It is not really hard to find places to buy motorhome jack pads because we can find them at RV supplies stores online and offline. But then, you can check them out on Amazon and other similar stores if you want a wider range of selection and affordable prices. Plus, these stores are selling mostly top brands. The best RV jack pads are great recreational vehicle accessories because they can provide a stable and even parking surface for our rig. They’re also easy to install and use under our stabilizing jacks or combined with other jack pads/blocks/levelers depending on the brand and model. We do hope you can choose from and use the right jack pad that will help take the pressure off your vehicle and reduce vibration and other sudden movements to add life to your RV.